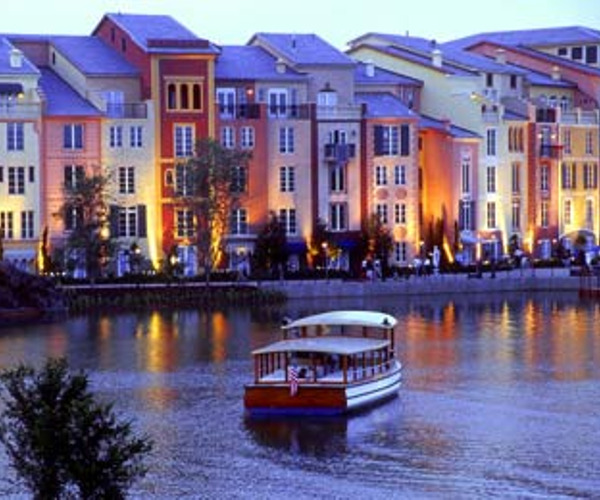 Loews Portofino Bay Hotel at Universal Orlando is a reproduction of an Italian Riviera seaside village, complete with cobbled streets, outdoor cafés, gelato, and bocce ball. 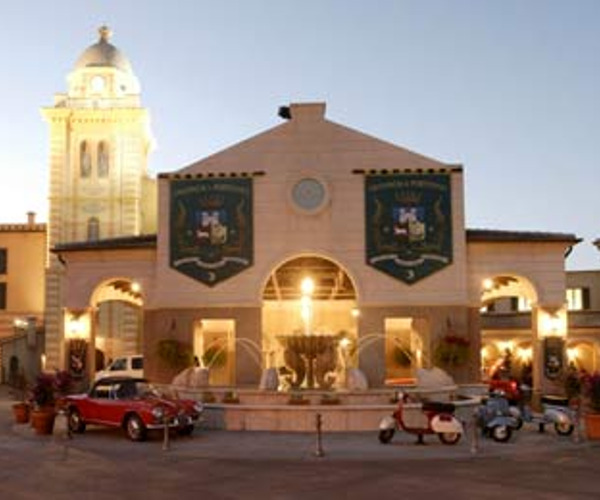 The harbor piazza, set along the bay's serene shores, is an ideal spot for a stroll during the day; by night, guests can take in musical and themed shows celebrating the Mediterranean's charm. Guests can indulge in signature Balinese-inspired therapies such as the Elemis Aroma Spa Ocean Wrap at the on-site Mandara Spa. Teens are invited to the spa for select services; additional family-friendly features include the hotel's Campo Portofino kids' complex. There are 750 guest rooms, 45 of them suites, with European-inspired interiors, three swimming pools, and 42,000 square feet of event space. Located directly in the hotel, the Galleria Portofino showcases paintings, sculptures, jewelry, and glass-blown art by Italian artists. Located on the hotel's first floor by the Piazza Ponte between the Beach and Villa pools, Mandara Spa is a 12,263-square-feet facility with 14 treatment rooms as well as a coed lounge and whirlpool, separate men's and women's sauna and steam rooms, a fitness center with individual TV monitors, and a full-service hair and nail salon. Therapies focus on Balinese-inspired services and include facials, wraps, cellulite treatments, massage, manicures, pedicures, tooth-whitening treatments, and hair, makeup, and waxing services. One of the spa's signature treatments is the Javanese Lulur, a traditional body cleansing that incorporates tumeric, red rice, fenugreek, jasmine cempak, and Ylang Ylang. In-room massage treatments are available as well as therapies for men and teens. The spa frequently hosts receptions with treatment sampling and hors d'oeuvres. When not spa-ing, guests can indulge in a variety of fitness and recreational activities at the hotel and in the surrounding region. Guests can team up to play the Italian bowling game of bocce on the hotel's courts or jog and hike along the property's three-mile loop. A complimentary shuttle takes golfers to and from three area courses. The family-style Beach Pool, with its two Jacuzzis, Roman aqueduct waterslide and nearby children's pool; the more opulent Villa Pool; and the secluded Hillside Pool are all part of Portofino Bay's swimming multiplex. "Dive-in" movies are shown poolside on select nights. Those staying at the hotel also have access to exclusive benefits to the various Universal Studios theme parks, including the bypassing of regular lines at most rides and attractions, complimentary on-site transportation, and priority seating at theme park restaurants. Guest rooms feature elegant European-inspired interiors with handsome Italian furnishings, touches of marble, and views of the property's gardens and pool, Portofino Bay, and the harbor piazza. Appointments such as flat-panel TVs, three telephones with dual voice lines, turndown service (upon request), and wireless high-speed Internet access provide a comfortable feel for both leisure and business travelers. The Presidente Suite boasts chic amenities such as a fireplace, mini-kitchen, whirlpool tub, dining and conference area, and roomy outdoor terrace; families may want to stay in the two-bedroom, whimsically designed Dr. Seuss Kids Suites. Guests reserving Club Level accommodations have access to a 3,500-square-foot lounge and personal concierge services. Mama Della's Ristorante introduces diners to Old World, home-style dinner specialties from Naples, Piemonte, and Tuscany; strolling musicians accompany meals, adding to the restaurant's inviting charm. Other options include Bice Ristorante, the hotel's fine dining restaurant known for its bay views, and Trattoria del Porto, a casual eatery offering family-style dishes of antipasti and desserts.